As a dietary supplement, mix one serving (one level scoop) of Amino Juice with 10-12oz of water. 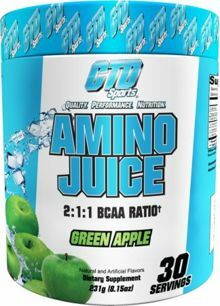 Stir or shake and consume during exercise on training days, or throughout the day on both training and non-training days. Take 1 serving scoop with 10-12oz of water. Stir or shake and consume during exercise on training days, or throughout the day on both training and non-training days. Cherry Snowcone This is a Buy 1 Get 1 FREE offer!